One of the sought-after CMS’s till date, WordPress is conquering the web industry owing to its extra versatile functionality. Not only does it helps entrepreneurs and bloggers to maintain their existence on the web but also grants them a competitive edge. Be it any occupation, WordPress platform offers you the right opportunity to expose business ethics at its best. Music is no exception in this case. So, if you are a musician and wish to create an enticing presence on the web. WordPress is the right CMS. Its user-friendly interface and ample customization options make it viable for creating an intuitive music website. WordPress also features some of the attractive themes that are high both on aesthetic and functionality. These themes will help musicians promote their music and brand on a global scale. Vice is a perfect pick for all those musicians looking forward to creating an artful, inspiring website. For beginners, the theme comes with video tutorials that help them get started easily. With the help of tutorial, developers can easily get through the installation process. A professional music WordPress website can easily be created with multiple color options and a design that is modern yet stylized. An option to create YouTube video in the background is also available. This way the aesthetic appeal of website is also increased. Dark and light palettes along with a custom image for background is also available with the theme. There are other over 120 personalized icons that come available with the theme. A 2-tier drop down menu along with 25 social icons makes it even more attractive. The theme is guaranteed to offer a consistent look and feel across myriad devices. Above all, the theme comes with the best music player on WordPress. Stereoclub is the best WordPress themes available in market. It is mostly chosen by WordPress professionals owing to its ability to save time and increase profits. If the only objective is to create an incredible musician website, you should definitely buy Stereoclub. There are 2 versions that come along with the theme, i.e. Standard and developer version. Developer version can be used for all projects and clients. Access to HTML and layered PSD files is guaranteed. The process of installation is completely non-technical and takes only a few minutes. It also has some advanced theme options that give clients control over the different settings. The design is responsive, i.e looks great on any sized-device and is entirely multilingual ready. Some of the interesting features of the theme include, 13 personalized widgets, 5 custom post types, powerful drop-down menu, translation ready and so on. It is one of the modern and technologically advanced highly responsive WordPress themes that is incorporated with tools, plugins and widgets that are objected specifically towards the music industry. Other incredibly advanced features of the theme include an integrated unique music player, powerful podcast, album post types, etc. Designed on a robust HTML5 framework, SONIK comes along with an amazing visual composer. A drag and drop builder plugin is also available that helps developers take creative control of the visual styling and behavior. Integrate WooCommerce with SONIK to market your tunes at a global scale. Colibri is an affordable way to create effective music website. This theme is a great choice disc jockeys, guitarists, singers and bands. It is easy to use, versatile and offers developers with a lot of options. Navigation is intuitive that makes it accessible for everyone to browse the website at ease. A large number of unlimited color options along with photo and video album integration makes it interactive. This theme features customizable headers, templates, color choices, multiple layouts and a live customizer. A ready to use drag and drop page builder also makes it a great choice for musicians. Featured with a bold and creative design, DJ Responsive is an easy to use theme that looks great on any device. There are some other notable features that come along like integration of audio player. The theme is fully customizable. Layout, colors and styles can be customized easily. Hammer offers a minimalist approach to design. It comes with a large slider on home page with social media icons. A site-wide music player is also available along with a beautiful display of featured images and crisp typography. Other features of the theme include video library, gig management, discography, font support and so on. Lucille comes with a visual composer for creating content purposes and all screen devices. It also features specific customizable design for photo, video, album and event posting. The theme also offers support for built in sharing buttons like Twitter, Facebook, Google, Youtube, Pinterest and so on. Beat Heaven is a WordPress theme for musicians, bands and music venues. The theme features event management to easily add and manage events from the website. A beautiful slider along with multiple styles and layout choices makes it even more attractive. This WordPress theme is specifically designed for event organizers, night clubs, musicians, DJ’s and so on. It is featured with a visually appealing home page slider, built-in media player, drag and drop homepage builder. Built exclusively for studio, festival, dj or singer websites, this WordPress theme is completely responsive, retina ready and easy to customize. Owing to its responsive nature, the theme responds elegantly to various screen sizes and has been tested to work across the largest of desktops to modern smartphones. Its easy to use visual page builder is optimized for speed and ease of use. This elegant, stylish, bold and readily responsive multipurpose WordPress theme is extremely popular owing to its hassle-free development of professional websites. The features of theme include an intuitive visual composer, revolution slider and layerslider plugins. 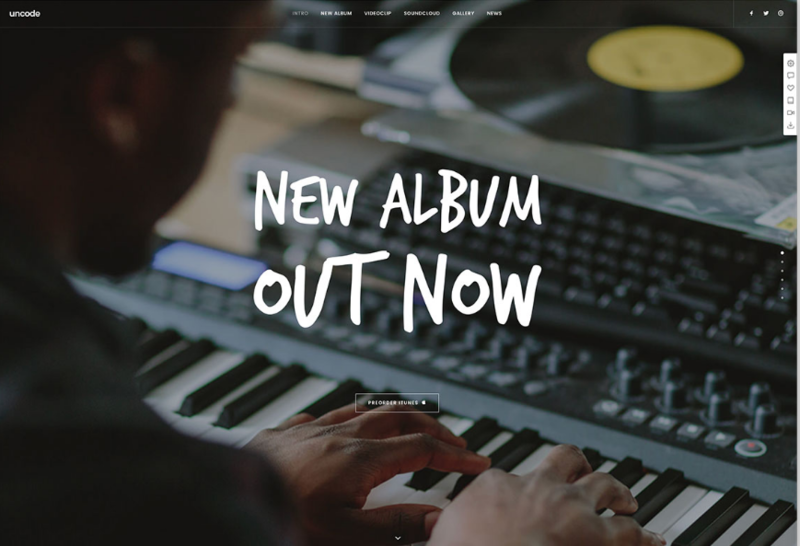 Merchato is a responsive and modern WordPress music theme which has powerful visual interfaces. 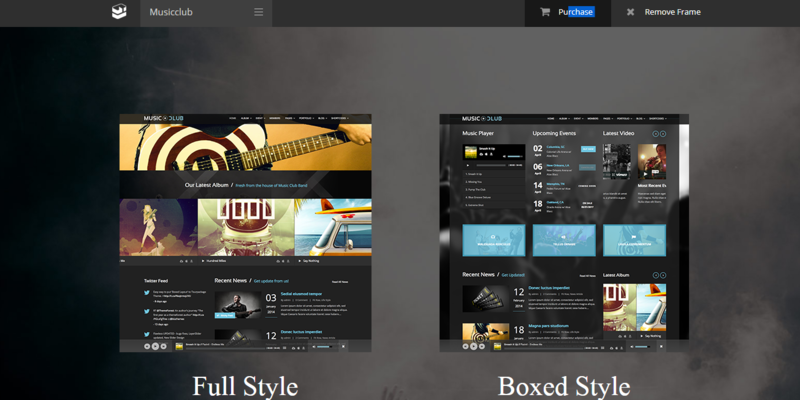 The theme provides an impressive platform for showcasing your music to the world. Real time customization is easily possible. Showcase your musical projects to the world in style via Merchato. Pantone is completely focused music WordPress theme designed specially for bands, singers and sound lovers. A single click demo is all required to deliver an awesome experience. Its modern design and flexibility allows you to customize the website according to one’s style and needs. The theme is extremely easy to configure and designed both for expert and beginners. Known for its visual design, Remix is a modern WordPress theme that features responsive layout. It is built using 12 column grid system and supports unlimited colors and sidebars. The theme is integrated with Drag and drop page builder, revolution slider, master slider that makes it an optimum choice for all music lovers. Croma is technologically advanced multipurpose WordPress theme that hosts a wonderful set of features. Some of the advanced capabilities of theme include HTML5-Powered music player for visitors to help enjoy your favorite MP3’s and tracks. A full range of amazing functionality associated with the theme are customizable playlists, album management and so on. Integrated with MailChimp, this professional WordPress theme is designed simply and is versatile. It is also ready for mobile use. Create your own unique and professional event website using this theme that also features built-in multi-language support. Theme comes with a very detailed documentation with screenshots. This acts as a guide towards using the theme in any WordPress website. Hugo comes with the largest collection of innovative feature. It uses the modern drag and drop technology. It makes it easier even for novice users to create attractive popular pages. Integration with WooCommerce enables website owners to create their own stores. The layout is responsive that keeps the users assured that ever pixel will respond as it should not matter what the device is being used. This classy WordPress theme is meant for musicians, bands, artists and music venues. A beautiful home page slider, event slider and news section is made available. Other features include discography, galleries, event management, artist pages and videos. This WordPress theme features a customizable homepage with featured content and music. Promenade is for those musicians who wish to stand out with class and style. An event management system and beautiful library make it stand apart from the crowd. Listed above are some of the best collection of music WordPress themes available in the category. Out of all these collection given above, if you couldn’t find the right one for your business, you can check out some more specific WordPress music themes to create functionally sound websites that work on all range of devices. Bryan Lazaris is a reputed WordPress developer employed at HireWebDeveloper (#1 comapny to hire WordPress developer ). He enjoys exploring latest WordPress technologies and taking new challenges. Apart from being a developer, he has contributed on all high quality write ups like WordPress theme and also loves to share his development expertise with the readers.